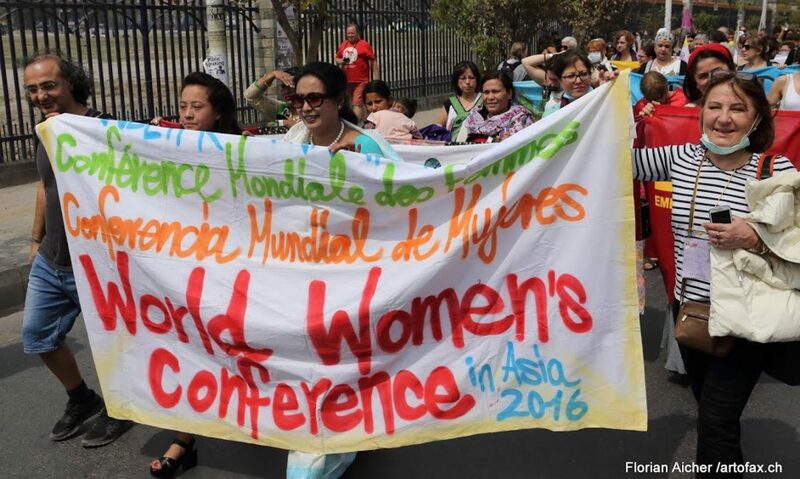 1 We use the three days of struggle and activities – March 8th, Mai 1st and November 25th and all activities in our country to make the World Women’s Conference publicly known as well as for mobilizing many participants and immediately start collecting donations. 2 We plan the elections of the five delegates, decide on the mode of election in our country and inform the world-coordinators about the delegates before1th December 2015. 3 We organize the inscription of many participants until 1st December 2015 and inform the world-coordinators about their number. 4 We write the country report about our country and send it to the world-coordinators in the English language until 8 weeks before the World Women’s Conference at latest (10th January 2016). 5 We cooperate with the young women for organizing the song contest. 6 We finance the participation of our delegations autonomously and try to support women from other continents with donations. 8 We organize all interpreters, which the women from our country need in Nepal (apart from those of the general assembly) and win further interpreters for the communication in the preparation and for the general assembly. 9 We plan our contribution for the common cultural evening/event of Africa / Europe and coordinate this Europe-wide together with the African coordinators. 10 We mobilize brigades for the preparation work in Nepal starting four weeks ahead of the conference. 11 The Conference proposes to build a transnational network with the Kobanê//Rojava network to support the reconstruction and to collaborate on a long term basis. (The group working together may change over time).The coordinators are assigned to coordinate this and to make concrete suggestions for the work. 12 The European Coordinators will provide all European delegates with the presentation on the initiative and development of the World Women’s Conference (including the pictures) in order to promote the World Women’s Conference in Nepal. Possibly complemented by the pictures of the European Coordinators’ report, showing the struggles and developments in the women’s movement in recent times. 13 The Conference decides that we all have to contribute to better national as well as international organization of the women’s movement. Therefore we use the three days of struggle but also the activities of the World March of Women 2015, especially the caravan’s stages in Europe and the second anniversary of the collapsed garment factory Rana Plaza in Bangladesh on 24th April. World Women’s Conference and World March of Women are not opposing each other, but we cooperate and support each other. 14 The women of the European Conference propose a workshop for the World Women’s Conference: “How do I organize my colleague?” This workshop is supposed to be prepared together with the Greek women and women from as many countries as possible. 15 The Coordinators are assigned to create an international flyer promoting the 2nd World Women’s Conference. 16 The women of the European Conference have proposals for further workshops at the 2nd World Women’s Conference: Build up women’s consciousness in the working class movement; Move and Organize grassroots women; Save mother earth! ; women’s liberation movements; women refugees; Fight sexism! 17 The Conference proposes to initiate a mass choir at the 2nd World Women’s Conference, where all women are able to join singing. Songs connects, through songs you can get to know each other, songs express feelings, singing helps to relax and it gives us power. The women from Germany are willing to take over the responsibility. 18 The next European Conference shall take place after the 2nd World Women’s Conference in connection with the women’s political council in Germany in October 2016. 19 We inform the women from other countries about important events in our own countries. We organize solidarity with resolutions and by that contribute to inform the public. 20 The 4th European women conference decides to organize translators/interpreters in all participating countries for the WWC in Nepal, which conduct a common preparatory seminar in order to learn and agree upon the techniques, contents, vocabulary and principles of the translation/interpretation.Every country names the participants by 1st October, the seminar will be conducted in November/December and SI will be asked to organize it and provide for material, technical equipment and the organization. 21 To understand environmental struggle also as women’s struggle is one of the assignments we take with us from the 4th European Conference in Athens 2015. Just like the Greek women reported about the work in the gold mines- destroying the foundations of life as well as people, or the French women informed us about the increasing number of cancer patients; let us comprehend environmental struggle as women’s struggle and realize it! 22 The 4th European Conference of worldwomen wholeheartedly supports the militant Greek women. We organize solidarity in our countries: The head of the corporations, the capitalists and the troika have to be put under pressure and the government has to be taken at their word so that the unjust measures carried out on the shoulders of the population are taken back. We demand a debt cut. All convictions of labour leaders haven to be taken back throughout the country. All group dismissals of steelworkers, of the cleaning staff of the financial department as well as of all employees in the private and public sector have to be taken back. All legislation hostile towards workers have to be taken back. All cuts of social welfare for poor families by order of the Troika and the EU have to be taken back. No government can give us our rights back if we do not fight for it. We do not have that much time and with all our might we have to build up pressure – until we will be VICTORIOUS! We are all Greek! 23 The 4th European Conference of worldwomen had the inspiring novelty of a meeting with nine Greek women’s initiatives – from the steelworker’s women in Aspropirgos, the cleaning women from Athens to the women’s solidarity house/shelter in Thessaloniki. It made obvious: Especially in the deepest crisis significant new women’s initiatives and struggles have developed. But they also decided: We have to connect on a long-term basis, in an organized way to enfold our complete power. And they took the first joint steps together with us, the worldwomen. For all Europe applies: Let us overcome the isolation of women – get organized! Let us overcome the fragmentations by breaking down the separation because of party political or world view borders in an ueberparteilich way (non-party associated).Let us strengthen ourselves by lasting and sustainable transnational coordination in the worldwomen’s process. Let us build up close alliances, e.g. worldwomen and the World March of Women, especially the caravan from Kobane to Lisbon.Women of the world, empower yourselves by organizing! 1 Wir nutzen die drei Kampf- und Aktionstage 8. März, 1. Mai und 25. November und alle Aktivitäten in unserem Land zur Bekanntmachung der Weltfrauenkonferenz sowie zur Werbung vieler Teilnehmerinnen und beginnen ab sofort mit der Spendensammlung. 2 Wir planen die Wahl der fünf Delegierten, entscheiden für unser Land über den Wahlmodus und teilen die Delegierten vor dem 1. Dezember 2015 den Weltkoordinatorinnen mit. 3 Wir organisieren die Anmeldung vieler Teilnehmerinnen bis zum 1. Dezember 2015 und teilen dem weltweiten Komitee die Zahl mit. 4 Wir erstellen den Länderbericht unseres Landes und schicken ihn bis spätestens 8 Wochen vor der Weltfrauenkonferenz (10. Januar 2016) auf Englisch an die Weltkoordinatorinnen. 5 Wir arbeiten mit den jungen Frauen zur Organisierung des Songcontests zusammen. 6 Wir finanzieren die Teilnahme unserer Delegationen selbstständig und versuchen mit Spenden Frauen aus anderen Kontinenten zu unterstützen. 8 Wir organisieren alle Übersetzerinnen, die die Frauen aus unserem Land in Nepal (außerhalb der Generalversammlung) brauchen und gewinnen darüber hinaus Übersetzerinnen für die Kommunikation im Vorfeld und für die Generalversammlung. 9 Wir planen unseren Beitrag zum gemeinsamen Kulturabend Afrika/ Europa und koordinieren dies europaweit und mit den Afrikakoordinatorinnen. 10 Wir gewinnen Brigadistinnen zur Vorbereitungsarbeit in Nepal ab vier Wochen vorher.